January 3, 2007: The LTTE is trying to protect its military assets (artillery, supplies, headquarters) by placing them in residential neighborhoods, and daring the government to attack, The air force bombers and army artillery often, but not always, attack anyway, and civilians get killed. The LTTE makes as much propaganda out of this as they can, but the LTTE cannot win hiding behind civilians. In the east, in the town of Vakarai, the LTTE is believed to be forcing up to 8,000 civilians to stick around and serve as human shields. The LTTE is also resorting more to forcing Tamil teenagers to join, and serve as fighters or support personnel. More of these kids are getting away and surrendering to police or army troops. 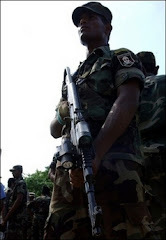 January 2, 2007: The LTTE is depending more on terrorist attacks, because the army has pinned down LTTE infantry units around towns like Vakarai and Trincomalee. The army wants to avoid taking a lot of casualties, so no major attacks are contemplated. The LTTE used to be able to make large, bloody attacks, but it has suffered a big decline in morale of late, and does not believe such attacks would work now. Over the last four months, three army officers have been accused to selling the LTTE information, for money. One of these officers, a major, is being prosecuted. Apparently an LTTE spy network has been broken up. January 1, 2007: The government is buying $100-200 million in weapons and ammo from Pakistan in the next 18 months. December 31, 2006: In the east, LTTE dissidents (the Karuna) group are now attacking LTTE camps. The Karuna rebels are moderates, willing to accept more autonomy, while the mainline LTTE want independence. There are at least several thousand Karuna gumen in the east. The main Karuna strength is in the east, and they are believed cooperating with the army. The air force is bombing LTTE targets around the eastern town of Vakarai. December 30, 2006: The increased violence is expected to slow economic growth. Projections for 7 percent growth in 2007, have now been trimmed back to six percent, or less. December 29, 2006: Vakarai, the last LTTE stronghold on the east coast, is about to fall. The place is almost surrounded by army troops, and navy gunboats make escape, or reinforcement, by sea difficult.